This time it was a Marcy Tilton giveaway for $100 of the fabric of your choice. Hey, I love quality fabric and Marcy has some amazing pieces of fabric. You should definitely stop by her site and spend some quality time drooling over the amazing pieces she has curated there. I thought it was a little heavier weight than it actually is...but if I underline each piece with a silk batiste or a silk or rayon lining...hopefully it will work for the pattern. 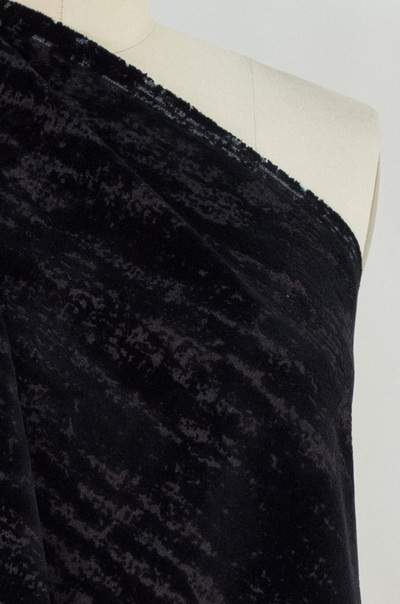 It will have a softer drape but that should make it perfect for spring/summer wearing. ...it reminded me of the fabric I used to make this vest and skirt...which I thought I'd given away but after checking...it is still in the closet. The second piece is a black velvet denim which is still on the site. Here is the link for it. I want to make a jeans type jacket from this Butterick pattern, originally sold in 2003, it's now out of print. I've had in the pattern collection for forever and I'm finally going to make it because it fits my present lifestyle. I want a simple topper to throw over outfits to wear in the office during the winter. In the spring it will be a great jacket for the warmer weather. This fabric/pattern combo fits into my Chicos Chic sewing philosophy. The pieces from Emmaonesock were pieces I'd been drooling over for awhile. 1.5 yards of a leather applique on mesh, 3 yards of a black denim and 2 yards of the cut out applique faux leather (both sold out on the website), 2 yards of a shirred faux leather. Links are provided to the two fabrics that are still on the site but I don't know how long they will be there. I'm sure that there won't be any new tenants added to the fabric collection any time soon because I've just bought my plane ticket to Seattle. Yes, I'm meeting up with Gaylen and spending a day at the Sewing Expo. So I've got to save funds for the Pendleton Wool and the Marcy Tilton booths! 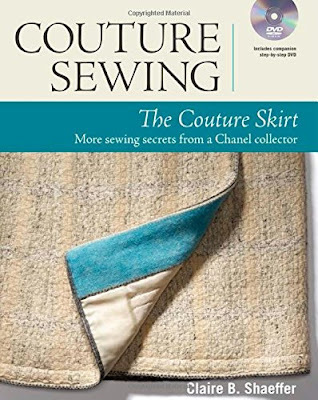 Another one of the things I bought with my gift card was this book, "Couture Sewing - The Couture Skirt" by Claire B. Shaeffer. When I went to put it on the bookcase, lo and behold, I already had a copy. So I'm offering it up here. If you'd like to win this book, leave a message in the comments by noon EST on Saturday, January 16th. I will pick a name then and post the winner shortly thereafter. The giveaway is open to everyone and will not be mailed until after Monday, January 18th because it's a holiday here in the US. Those are beautiful fabrics. Can't wait to see what you make. I'd love to win the book. I would like to win...Thanks for the chance. Am so glad to hear you will be at expo again. The last 2 years I have been working Marcy's booth and hopefully I will be there again and able to say hi again. Your blog is wonderful. Paula I will look for you! "The Couture Skirt is on my Amazon wish list. It would be a nice addition to my library. I would like to participate in the book giveaway and hopefully will be lucky :-). Gorgeous fabric choices! Those faux leathers look very you. (Don't add me to the book giveaway though, I seldom wear skirts and it should go to a good home). I just added a very nice piece of black stretch denim to my collection. I was thinking ankle length pants. Would love the book. Thanks for the giveaway. The faux leathers are beautiful - can't wait to see what you make with them. That applique faux leather is particularly gorgeous. Please enter me in the draw--I'd love that book. Oooh I'd love to win the book - I never win anything and I'd like to get to grips with some couture techniques this year :) Thanks for a lovely blog btw - I always enjoy reading it and am amazed at how much you produce! I am looking forward to seeing your new creations. Please enter me in the drawing. Your choice of fabrics is gorgeous! I would love to win the book. Please enter me!! Me, me, me! For the book entry! Those faux leathers!!!! Yummmmmm! I have a floral faux leather from EOS waiting for spring time. I'd be thrilled to win a copy of "Couture Sewing - The Couture Skirt." Thank you for the opportunity. Your new fabrics are great! I can't wait to see your finished garments. Interesting book. Please enter me in the drawing for it. I'm glad I'm not the only one who buys a book and finds that I already have it. Love the new "additions" to the cave. Love to live vicariously as far as the fabric buying... you have such great taste in fabric. Your family/friends know you well as far as gifts don't they. Please enter my name for the skirt couture book. That would be a great addition to my sewing book collection. Which includes a high school notebook from my grandmothers sewing classes from the 20's with pictures she had cut from magazines etc. Such a fun read. I love that skirt/vest outfit you re-posted. That has always been one of my favorite things you've made. I would love to have a chance to win the book, thanks! I would love to be in your generous drawing for Claire's book. Thanks for the opportunity. Is your winning fabric an embroidered silk dupioni? As I was putting together your pattern and fabric choice my curiosity wondered. That pattern has really intrigued me as well and I hope you make it soon so we can get a good review. Bunny - I thought it was duppioni weight too. I'm hoping the pattern pieces aren't too unusual and that the silk batiste will make it firm enough. We shall see because I have everything but the pattern on hand! Your fabric editions are drool-worthy. I really appreciate that you curate your selections - they go together, so that you can make coordinating outfits. I wish I was more disciplined! I just buy whatever fabric stands out to me, so that I have a bunch of unmatched fabrics in my stash. I would love to have the couture skirt book. Thanks for the giveaway opportunity! Hi there, I you love to add that book to my mini library for sewing. I been watching that book on Amazon for a while. Thanks! Love the fabrics. Yes, please add my name to the giveaway. I just returned this book to the library yesterday and would love to own it. You can add my name to the book giveaway list - I've been meaning to get that one! I'm looking forward to seeing what you do with that applique leather. That's a very cool piece of fabric! Sounds like an awesome book to have. Count me in and thank you. BTW, love your new fabric acquisitions. Please add me to the giveaway. That looks like an awesome book. Please enter me in the giveaway. I've had my eye on that velvet flocked denim. Very nice for the jacket. I would love to spend a day touching your stash and admiring your shoes. You never cease to amaze me. If not sewing you are working, or you are on the bus. You make time for reading or watching tv or playing with the grand kids and your daughters.You manage to turn out terrific garments at the speed of light. You then write terrifuc blogs about what you have been doing. This leads me to an obvious question. Just when in the heck do you sleep?! I forgot, please enter me in your gieaway. Thank you. Beautiful additions to the stash! Thank you for the opportunity to win the book. I checked my shelves to be sure I didn't already have it too! Thanks for the generous offer - I'd love to be entered in the drawing for the Claire Shaeffer book! The fabric that already lives with you needed new neighbors! Can't let any fabric be lonely!! Would love to win the book. (Very envious of your sewing skills, abilities, and the way match fabrics and patterns!) Happy sewing!! I'd love to win the book. Now if only I can get my hands on some of that gorgeous Tweed Posie. Silliness. As if I won't fall in love with 5 other fabrics while I hunt. In my studio I have a clip of a jacket made from mesh with black leather cut outs. The shapes of the cutouts are different but it definitely has the same feel. It is a simple Chanel and I could send a photo if you would like to see it for inspiration. I'm enjoying your blog and would love to win the book. Will do - This one is on my inspiration wall. I would love the book. I have always admired your taste in fabric and style. I would like to be considered for the book giveaway. I'm hoping that 2016 is the year I win something. Claire B. Shaeffer is a great teacher. You have added some nice pieces to your collection and I can't wait to see the finished garments. I would love the book if my name happens to be chosen! Thank you! I love your definition of your new style: "Chico's Chic!" I think it perfectly defines what I'm trying to achieve now that I'm retired and have more time to sew. I'm determined that I won't leave the house, even to go grocery shopping, unless I'm put together. I mix my own makes with beloved Coldwater Creek pieces and, yes, some new Chico's items. I think my hubby appreciates it, too! I like seeing what you do with your faux leather. I'd love to be entered in the giveaway. I've shown pics of your fabric collection you have posted so he couldn't say anything about mine!�� I'm enjoying reading about your sewing adventures. Please enter me in the drawing! Thank you! Seeing your fabric and your makes and hearing about all of the changes you have been going through is very inspiring. Thank you for taking time to share with us. I've lived in Seattle for 19 years and I only found out about the Sewing Expo in Puyallup last year, but it was too late. I got on the mailing list and I'm planning on going this year. Yay! Love your fabric choice for the blouse pattern! and your faux leather choices are absolutely beautiful!!! Happy sewing! What beautiful fabrics - worthy additions to your stash! Yes, please, I've love the book. I love buying new fabric. You made good choices. Can't wait to see what you make with them. The faux leathers are so so nice - I see what a faux leather skirt or dress or pants??? Please include me in the drawing for the book. Great new fabrics you've added !!! I'd love to win the book - thanks for your generosity . Love the new tenants in your collection. Nice faux leather pieces!!! There is a skirt book too?! How was I unaware of this? I would not only accept such a glorious offering but I would love it as my own. I'd love to win the book. Thanks for the opportunity. Your fabrics are so lovely! I really would love to have that book, is what I was thinking when I was reading that you purchased it...lol and then you found you already had it! Please enter me! I love the faux leather pieces you got. I noticed you bought 1.5-3 yards or fabric. I am a new sewist and was wondering if you buy what the pattern suggests or go over and buy extra just in case. Especially in cases where you just love the fabric and have no idea what it could be used for yet, how do you guess? I hope this question makes sense. Thank you for offering the book to your readers. That is a lovely gesture and I know all reading this blog appreciate it and you! Really enjoy seeing what you are sewing. Very interested in improving my sewing. Love that Marcy Tilton flocked denim! Don't put my in for the book. I have that one too! Thanks for the giveaway. I'm glad that I'm not the only one who buys multiple copies of books. I think your fabric choices are awesome. Please enter me for the giveaway. What interesting fabrics. I have some leather and I believe a piece of faux leather, all of which I'm afraid to use! Oh I would LOVE to win a copy of that book, it looks wonderful! The black velvet denim and the cutout applique faux leather are beautiful pieces. The pattern you chose for the jacket is going to be really luxy-casual, I can hardly wait to see it! Girl, you are so generous! You have an interesting blog in which you share your creative processes with us and now you're giving away an interesting looking book. Wow! I am looking forward to seeing what you create with those faux leathers. See what you done gone and did! Of course I clicked on the link because that shirred faux leather is amazing!!!! I love watching you create a wardrobe for your new casual work environment. You are showing that you can be very stylish and casual at the same time. Also, congrats on your weight loss. You look wonderful. Would like to win the book and continue to improve my sewing skills. Keep blogging and inspiring! That would be an exciting book to have. Count me in on the drawing! Please include my name on the list for the giveway, I too would love to have that book. I do enjoy your posts, they are so informative and helpful and I love receiving them.